There are numerous independent personal CONCIERGE companies that provide errand services and information services for their members. Services include informational requests, setting dinner reservations, making telephone calls, researching travel arrangements and more. Typically, concierge companies will bill on an hourly rate, and depending upon the type of task, fees can fluctuate drastically. Other companies bill a flat monthly fee based upon the number of requests a member is allowed to place each month. In the United Kingdom, since the year 2000 and as of 2010, concierge has become a key marketing and loyalty tool in the banking sector and offered as a benefit on luxury credit cards. This service offering is also known as lifestyle management. Concierges also entertain their clients. 5-star concierges: The wild requests of the mega-rich - CNN travel. BEST LUXURY CONCIERGE COMPANIES - JustLuxe. CONCIERGE SERVICES - " - Rankings Of Best." YouTube. CONCIERGE SERVICES at the beverly hills hotel - Dorchester Collection. Hotel Concierge Services - AskMen. I Was A Concierge For American Express Platinum And Black Cards - Reddit. LUXURY HOTEL CONCIERGE REVEALS THE WEIRDEST REQUESTS HE HAS EVER RECEIVED - The Independent. MasterCard vs. Visa: Which Has Better Concierge Service? - HuffPost. meet the VIP travel concierges - "Pet swimming pools, helipads and no paparazzi." Over-the-Top Concierge Services - "The concierge profession is most often associated with high-end hotels, but the industry is populated with concierge businesses that serve corporate, residential, retail and private clients as well." The Cultivation of a Concierge - The New York Times. The Hotel Concierge: A User's Guide - Forbes. The Ultimate Guide to Credit Card Concierge Services - Gen X Finance. The world’s best luxury concierge services for the super rich - Tatler. This Smartphone Comes with a Concierge Service - Bloomberg. Top 5 Most Outrageous Concierge Requests - Forbes. Top 10 CONCIERGE SERVICES - "Concierge Services. Best Concierge Service, Reviewed and Compared." Top Luxury Concierge Websites For The Super-Rich - Forbes. Alberta La Group - "Serving lifestyle experiences." Since 2006, we have managed the most exceptional lifestyles of the most discerning clients belonging to the public eye. With high standards but lack of time, our clients require distinguished services, exclusive attention and completely customized solutions to meet their needs for personal and family organization. All Star Concierge - "Luxury Lifestyle Management." How much time do you spend researching, scheduling and coordinating tasks? We are a practical, convenient and cost effective way to help you save time, increase efficiency and revitalize your current lifestyle. By leveraging industry networks and preferential relationships with thousands of global partners, we have the resources and knowledge to carry out any requests to your exact specifications. From running basic household errands to catering your chartered yacht, our staff finds inspiration in understanding each individual member’s needs and guarantees your complete satisfaction. AMBER LOUNGE - "The Original F1 Experience." The ultimate VIP nightlife experience which follows the F1 Grand Prix series around the world. Venues: Monaco, Singapore, Delhi & Abu Dhabi. Based On A True Story - "We advise, inspire and manage all your travels; flights, transportation, accomodation, basic activities. We build into your journey unique and extraordinary experiences. We create a magical world where reality and fantasy are intertwined." BILLIONAIRE'S CARD - "Billionaire Vodka has the benefit of Billionaires Card Concierge service available globally 24/7 in your preferred language at home or away. Billionaires Card Concierge is always there when you need it from gift ideas to a table for two overlooking the Alhambra at night." BlaQ Elite - "Lifestyle Management & Concierge Service." In the world of corporate travel and concierge services, BlaQ Elite creates unparalleled and premium luxury experiences. Our extensive knowledge of the financial industry allows us to curate a perfect experience that will exceed your expectations. We have over fifteen years of experience with corporate-level executives in investment banking, hedge funds, prestigious law firms, and private equity firms. Our clients also include celebrities, athletes, politicians, and other discerning individuals. BLUEFISH - "Personal Concierge Services For VIPs & Executives Requiring Luxury & Adventure." From our underground status as a secret society in the 90’s, our unprecedented blunt-edged and bold-faced attitude to our impressive pedigree involvement with such high profile events as Hollywood Award Shows, Formula 1 Paddock Club, Polo, Movie Premieres and New York Fashion Week, over the past decade Bluefish has secured its provocative reputation as the premier lifestyle, concierge, and travel service to the rich and famous. BON VIVANT - "London’s leading luxury concierge service, offering you the opportunity to delegate your lifestyle management, make the most of your free time and maximise your VIP lifestyle. Whether you want to travel to the most exclusive destinations and hotels, be the first to try the hot new restaurant or club, have access to the best tables at an award ceremony or hospitality seating at a premier sporting event, Bon Vivant's unrivalled expertise, contacts and insider knowledge will make it happen." CARTE BLANCHE PLUS - "Tout est possible. Meme l'Impossible." Concierge service and lifestyle management. Exclusive private members club; invitation open only to those who enjoy and indulge in a luxury lifestyle. Carte Blanche Plus provides the ultimate luxury lifestyle consultancy that saves you time by offering you the very best. cogemad - "Undevided Attention." Inspired by the impeccable amenities of the world's most luxurious residences, we provide premium concierge services for our clients. COUTTS Concierge - "Elite personalised service." Coutts Concierge is there for you 24 hours a day, seven days a week. With over 20 languages spoken they can help smooth any local communication issues. Coutts & Co, the UK’s leading private bank, is today reclaiming the top spot in the super-premium charge card market by launching Coutts World card a ‘cut above the rest’, offering an extensive concierge service, exceptionally high AirMiles collection rate, comprehensive insurance plus privileged access to a range of luxury goods, services and exclusive special offers that have been created with the lifestyle of Coutts’ clients in mind. Element Lifestyle - "Luxury Travel & Concierge Services." The world's leading luxury travel company and private members' club. We customize luxury travel, events, and unique experiences. Essential Time Concierge - "Acquire the luxury of Time. Essential Time Concierge, unrivalled expertise, with over 30 years of combined experience recognise the most precious commodity in the world is time. Each client has a bespoke personalised portfolio of services to match their particular requirements. Every membership is fully customisable, to the clients needs, taken from our unique range of services." EXCLUSIVE GP - "Concierge Travel & Hospitality Specialists." F1 Hospitality and Grand Prix Packages. ExclusiveGP is an ATOL protected F1 travel and F1 hospitality company for both private individuals and high-net-worth corporate clients. Working alongside some of the world’s leading Formula One experts, we specialise in offering bespoke Formula 1 Travel packages to every single Grand Prix race across the planet. Clients range from discerning individuals and groups looking to savour the Grand Prix VIP experience, to large corporations wishing to treat employees or important clients to a thrilling F1 Tour. First Ladies - "Bespoke Ladies Lifestyle Concierge." We are London's the first ladies-only private members concierge; a three-part concierge, offering a luxury, essential and corporate services. Golden Ticket London - "A unique property search and concierge service to the film and entertainment industry." London / Los Angeles. Grand Concierge - "At Grand Concierge & Home Services, we offer a complete range of services for second homeowners, as well as guests and vacationers who are visiting the Winter Park and Grand County area." Colorado, U.S.A.
HEADCONCIERGE - "Making the difference." Personal & corporate concierge services. Henry Cookson Adventures - "Leading authority at creating tailored adventures and luxury experiences from the ground up. From playing a part in the Walking With The Wounded expedition with HRH Prince Harry to searching out the most elusive of marine life in the world’s oceans, we are experts in organising the supposedly impossible." Innerplace - "Innerplace is the definitive lifestyle concierge service, specialising in access to the most exclusive parties, entertainment, nightlife and dining in London." John Paul - since 2008. "Our mission is to make your daily life easier. John Paul is available 24/7, 7 days a week, anywhere in the world, to respond to its members’ needs. Going beyond ordinary customer satisfaction, John Paul constantly strives to surpass expectations by knowing our clients well and anticipating their needs. The pursuit of excellence is in John Paul’s DNA." Offices: Berlin - Lisbon - London - Luxembourg - Marrakesh - Miami - New York - Paris - San Francisco - Shanghai - Singapore - Sydney - Tokyo - Toronto. Knightsbridge Circle - "The most exclusive members lifestyle club in Europe." Our team have many years of experience in the travel, concierge and financial industries. Our Clients lead busy lives and move in privileged circles. Knightsbridge Circle is there to pro-actively anticipate client’s needs, negotiate exclusive savings and deliver the highest level of personal service. Membership is capped to guarantee quality service. Using our long established network of industry contacts, Knightsbridge Circle source the best events, restaurants, hotels and tickets in the world and use our leverage to ensure our clients take priority. Les Concierges - since 1998. "Turning aspirations into experiences. Anywhere, any time... with service beyond expectations." LesConcierges is the world’s premier provider of global concierge services and solutions. We represent and enhance your brand to generate loyalty from your most valued employees and most treasured customers. Turning routine requests into memorable experiences makes us different from the rest. Our highly trained concierges staff delivers professional and personal assistance to meet our clients’ business and lifestyle needs – from the everyday to the extraordinary. Luxcierge - London - Paris - Nice - Cannes - Monaco. "At LuxCierge our exclusive clients have no limits on what they can purchase so the most exclusive luxury we can supply is time. We work with our clients to remove every possible nuisance, annoyance, and time-wasting activity from their lives. Gone are the exasperating concerns over travel, property, maintenance, shopping, child care, pets, entertainment... the list is endless! To go where you want to go, to experience what you want to experience and to share these things with the people you love without thought, or care, or concern is our focus." Luxury Concierge China - Affording You the Luxury of Time. Unique Customised Experiences. Truly Bespoke Travel by the China Insiders. "It's simple - you choose how much or how little you want. It's all in LCC's little black book - from the wildly extravagantly to the funky and hard to find." China and Hong Kong. Majestery - "Treat Loyalty like Royalty." An innovative luxury concierge platform for your most affluent clients, provided as a seamless extension of your brand. MasterCard CONCIERGE SERVICE - "There are some things money can't buy, for everything else there's MasterCard.". Whether you are looking for tickets to a sold-out concert, want help planning your annual family vacation, desire dinner reservations for a well-deserved date night or hope we can help you find a last-minute gift for someone special, MasterCard Concierge Service is here to help. Mayfair Chan - "Lifestyle Management." Perfection comes as standard. Mayfair Concierge - "Anything you require." Dedicated to looking after all of our client’s needs when they visit London, the UK or wider Europe, ensuring they have a fantastic time. Our independent concierge service is founded on 30 years of experience and an intimate, personal knowledge of London, the UK and Europe. This allows us to make unbiased and educated choices based on excellence, so that every need - big or small - is met to the highest standard. MeetnGreetMe Travel Concierge Services - "We are ready to MeetnGreet you in more than 160 cities around the world. MeetnGreetMe is a global platform connecting international travelers and local people for getting personal concierge services and lifestyle management. Contact and hire local people as your personal assistants to take care of your needs when you travel." Mezi - "AI for Travel. Mezi is your Personal Travel Assistant. The more you go, the better it gets." American Express has acquired Mezi. MILLIONAIRE'S CONCIERGE - "Your Access To The Most Inaccessible VIP Events & Experiences Worldwide." Mint Lifestyle Management - "Concierge Lifestyle Management Tailored to You." Personal and Corporate Lifestyle Management. Our aim is simple. To give you back as much of that precious asset - time - as we possibly can. Our clients benefit from having a dedicated lifestyle manager who is trusted and well connected to advise and assist with any request. Nota Bene - "Manages bespoke travel and lifestyle for an illustrious international clientele. Passionate in the art of discernment and service. With our team we travel the world in pursuit of the exceptional and unforgettable, just as we have done for over 30 years. Nota Bene counts among its followers many of the world's most influential people from finance, fashion, the arts and business. We offer expert advice and top-level management services for an exclusive private clientele. Arranged for the very few." Osborne & DenÉe - "Unparalleled luxury concierge service providing worldwide support to our clients around the world, assisting with any requests from arranging transfers, getting last minute tickets, booking reservations or gaining access to a member’s only club." Pall Mall Concierge Service - "The Royal Automobile Club offers a Concierge service where expert advice and assistance can be provided with theatre tickets, sporting events, concert tickets, gift shopping, car services and restaurant recommendations. Private tours, trips and that elusive last-minute reservation at the latest restaurants." Pocketlife - "Nothing is impossible with Pocketlife!" Concierge. Lifestyle. Management. Pocketlife is reigniting what it means to be a VIP. As an exclusive luxury concierge, we bring the best to the table in the form of private and corporate memberships. Prime Lifestyle Concierge Services London - "At PRIME LIFESTYLE Concierge Services we understand that our clients are used to the very best. Not only can we plan the perfect getaway, or organize the most spectacular event, or find that elusive pair of designer glasses from Italian Vogue, or suggest a great Restaurant and/or perfect bar for a Saturday night, but we do it all with your specific tastes in mind." PRIVÉ INTERNATIONAL - "The Art of Living Well." The world's leading bespoke luxury service. We are a members only company providing unique amenities for our members, who value convenience, luxury, exclusivity and impeccable delivery. Each membership is custom tailored, providing you the highest quality in services. Offering unlimited access for high-net worth individuals and corporate executive's access to our increasing portfolio of destination properties, private jet/yacht charters, personal security detail, and exotic automobiles. PROMUS LIFESTYLE - Luxury Concierge service and Lifestyle Consultant, based in Portugal. PROMUS is a specialized concierge service and lifestyle consultant operating 365 days a year, internationally. With specialized partners controlled by strict quality standards, PROMUS will service you anywhere, anytime, with all your particular needs and requirements in mind. QUINTESSENTIALLY - since 2000. "The world leader in luxury lifestyle concierge wherever you are in the world. We're on hand to assist you 24/7/365." One of the largest and most well-known members-only concierge companies in the world, co-founded by Ben Elliot (the nephew of Camilla, Duchess of Cornwall and wife of Prince Charles). With 60 offices worldwide, and 32 sister businesses comprising the Quintessentially Group, their team has access to insider knowledge invaluable for procuring tickets and reservations to exclusive restaurants, clubs, operas, and galas. Elite membership is invitation only and ranges from US$10,000 to US$45,000 per year. Red Butler - "Business Concierge & Executive Assistant Services." Established in 2005, Red Butler is the leading business concierge provider to entrepreneurs, professionals and Fortune 500 companies. We help people save time, access perks and become more productive. SMSA - "Leader International de la Conciergerie | A votre service 24/7 et partout dans le monde." The Moroccan Service and assistance Company is a luxury concierge service offering personal assistance by taking over all its clients everyday and unexpected tasks and headaches. The concept is similar to the services provided by a luxury palace's concierge, who will take care of all his clients worries and to simplify their lives by allowing them to save time. Our agents are available to provide clients with all the services or products they might need by using a very qualified network of suppliers. They act with professionalism, courtesy and discretion, they are always available and their only job is to satisfy as best the client's requests. TEN - Lifestyle concierge. "Friendly, professional Lifestyle Managers are on hand 24/7 to help you get the most out of life by taking on anything that you don’t have the time, expertise or inclination to do yourself. Our experts are each specialists in a field such as travel, retail or motoring. They take time to understand your needs then use their insider know-how and contacts, plus the combined experience of over a million requests to date, to deliver great results - faster (and often cheaper) than if you had acted alone. This is Intelligent Support." The Berkeley | London Concierge - "When you stay at The Berkeley luxury hotel, our concierge team looks after your every need, both in the hotel and out and about in central London. They know the hottest spots for shopping and sightseeing, and can book you anything from a theatre reservation to a private jet." The Hamptonite Club - "The Ultimate Hamptons Concierge." Based in the heart of the Hamptons, The Hamptonite Club is your personal assistant specifically purposed to tend to the needs as your Luxury Lifestyle consultant and private Concierge. Based in the heart of the Hamptons, The Hamptonite Club is your personal assistant specifically purposed to tend to the needs as your Luxury Lifestyle consultant and private Concierge. The Key - "We present exotic and inspiring experiences that immerse your sense of wonder. We define our experiences as remarkably uncommon bespoke moments created on request for our members and their families and friends. We bring magic and spirituality into every experience we create, helping our members to have a once in a lifetime personal journey. We create bespoke travel Itineraries, bucket list quests, and spiritual journeys to the world’s most exotic and unexpected locations. Our speciality is offering superior accommodation and organization, teamed with safety and cultural education as the pillars of our work." The Organisers - "Highly efficient team of personal assistants who have been providing solutions to corporate and domestic challenges since 1998. Our bespoke concierge services go far beyond those offered by more traditional concierge and lifestyle management companies. We work as your private office, giving expertly tailored and confidential PA support on everything from business travel to property management." THE WORLD'S FINEST CLUBS - recognises that your time is too precious to be kept waiting in queues. As a world traveller you are used to a welcome with a smile and to be personally guided to your exclusive table in the most luxurious venues: exlusive clubs, hotels and restaurants. 24/7 Concierge Service for club and hotel reservations. Invitations to exclusive parties and the world-famous Finest Events. VERTU CONCIERGE - "Imagine a world where, at the touch of a button, you are instantly connected to a team of experts with a global wealth of knowledge, experience and contacts." 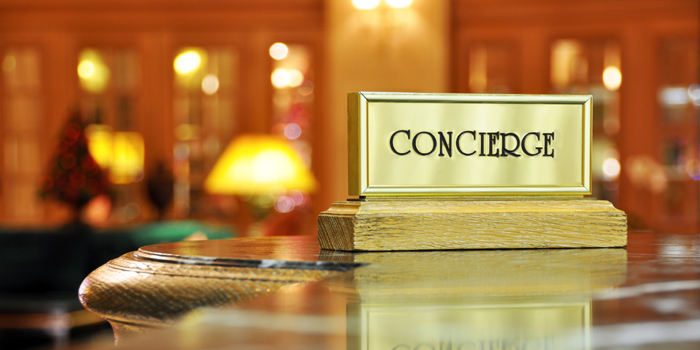 Concierge offers 24-hour worldwide assistance, recommendations and priority bookings. They facilitate your every request, from finding the perfect gift to accessing 'money-can't-buy' events, experiences and everything in between. Your Concierge will fulfil every request using their unique expertise and inside knowledge. virtual concierge solutions - "We masterfully design, create and manage private-labeled, completely customized, totally interactive virtual concierge services. Our solutions promote your brand by linking employees, residents and customers to a dedicated 24/7 virtual concierge providing a localized marketplace all under one roof. As a seamless extension of your organization, we provide a high-touch solution specifically designed to increase productivity, engagement and profitability." Visa Infinite Concierge Service - "For everything you need." Your personal assistant Visa Concierge will work for you 24 hours a day, 365 days of the year, to ease every single moment of your day. Do you need to make a reservation at your favorite local restaurant? At the destination where your journey takes you? Do you want to take the trip of a lifetime? Do you need tickets for that special event? Visa Concierge will help you with all this and more. Visa Signature Concierge - "Complimentary personal assistance anytime, anywhere." At your service, 24/7. Planning a weekend getaway? Let Visa Signature Concierge help you. From locating the perfect luxury hotel to booking tickets, your concierge is here to help you any time, night or day. WORLD CLASS CONCIERGE SERVICES - "24/7 World Class Concierge Services." Whatever your need, from collectibles to theatre tickets and events, and from special corporate parties to celebrity bookings, if you can imagine it, World Class Concierge Services can make it happen. Staff with over 50 years in the concierge services industry and a worldwide database of specialists gives us an edge. Let us unlock your ordinary and extraordinary doors with the best in personalized, professional concierge services.